Richard Dawkins has redefined himself again. Earlier, Dawkins transitioned from academic works of theoretical biology to his popular atheistic manifesto, The God Delusion. Now, Dawkins has moved on to the scientific education of youth. Combining lavish color illustrations by David McKean with his own supple and enthusiastic prose, Dawkins aims to inspire a new generation with the belief that naturalistic science is the only source both of knowledge and of true “magic”-the poetic wonder of discovery. Dawkins’s approach is to mold impressionable minds with the presumption that all that really exists is a closed physical universe of pitiless indifference (p. 235). Pursuing the logic of natural selection, he concludes that a living creature is simply “a survival machine for genes. Next time you look in the mirror, just think: that is what you are too” (74–75). This means that the “poetic wonder” of scientific discovery has no ultimate significance. There are no valuable truths to discover, nor valuable people to discover them: we are lumbering robots in a meaningless world. Like the Green Book criticized by Lewis, Dawkins’s book will likely produce more people “without a chest,” closed to the transcendent realms of God’s moral law and saving work. Propaganda. 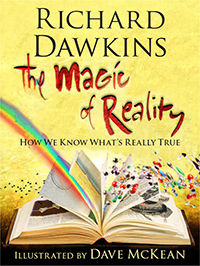 Throughout Dawkins’s entertaining text, which explores biology, astronomy, chemistry, physics, natural disasters, and alleged miracles, Dawkins seeks to discredit biblical revelation by citing its stories as myths alongside pagan myths and modern “urban legends.” Thus Genesis is presented with Norse mythology (34–35) and Dawkins repeats the old chestnut that since there are elements in common between the flood account in The Epic of Gilgamesh and the Genesis flood, the latter is cultural borrowing (140–43). Although there are some similarities, many of these would be expected in any flood account, and there are also marked differences. Most importantly, Dawkins does not seriously consider the possibility that both accounts arise from an actual historical event. Worse, when archaeologists do find evidence of the historicity of a biblical event, Dawkins attributes it all to purely natural causes anyway (208–9). And he relies heavily on David Hume’s famous critique of miracles (254–65), with no reference to John Earman’s devastating critique, Hume’s Abject Failure (Oxford, 2000). Invincible Ignorance. Evidently, Dawkins has adopted a position that makes it impossible for him to contact transcendent realities. Dawkins tells us he would never accept a supernatural explanation regardless of the evidence, “Because anything ‘super natural’ must by definition be beyond the reach of a natural explanation” (23). But refusing to allow supernatural explanations does not show they are false. And Dawkins continues to complain that “none of the myths gives any explanation for how the creator of the universe himself…came into existence” (163), refusing to allow the idea of a necessary being that has no origin. Interestingly, Dawkins never considers the possibility that theism might give a better explanation than materialism for the success of the science he prizes. Why does the world conform to orderly laws? Why should we expect our minds to be capable of discovering them? If he faced these questions without prejudice, Dawkins might begin to see that there is a deeper magic still. Angus Menuge, Ph.D., is professor of philosophy at Concordia University, Wisconsin. His book review, “Dawkins’s Youth Ministry” appears in the Volume 35, No. 1 special “Origins” issue of the CHRISTIAN RESEARCH JOURNAL available by donation only. 1. C. S. Lewis, The Abolition of Man (New York: Macmillan, 1955), 16–17. The article above is from the current, special origins issue of our award-winning magazine, the CHRISTIAN RESEARCH JOURNAL | What Were the Origins of Life on Earth? This special issue is packed full of compelling articles by many of the biggest names in the Intelligent Design movement, relating to all aspects of the origins problem—scientific, theological, philosophical, hermeneutical, and apologetic (see the Table of Contents here). But not only so, this special issue also features a sneak peek at Hank Hanegraaff’s forthcoming Creation Answer Book!